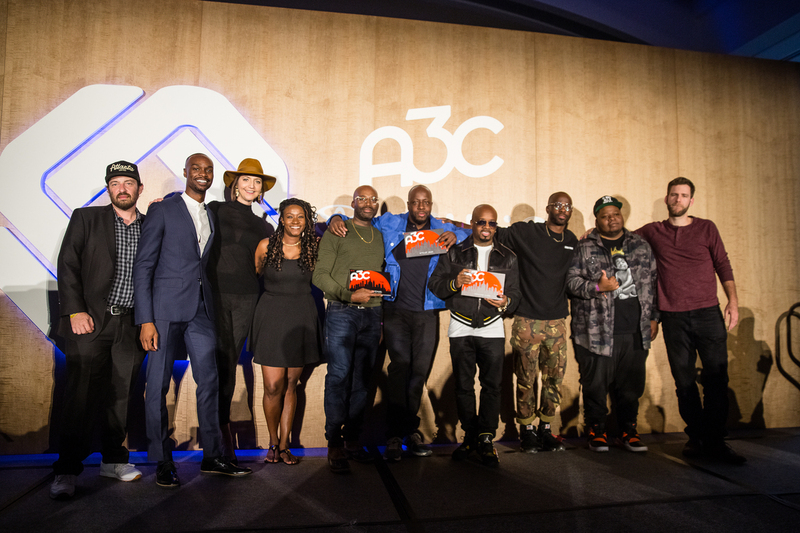 Atlanta, GA. 4 October 2018 – Gearing up for an amazing A3C week, A3C and ChooseATL hosted their 3rd annual ‘Welcome to ATL’ reception honoring Wyclef Jean, Jermaine Dupri and Rodney Carmichael. Over 250 guests gathered at the Loudermilk Conference Center for southern cuisine, crafted cocktails and live music by The Nourishment while celebrating the guests of honor. A3C Director and Partner, Mike Walbert and ChooseATL Executive Director, Kate Atwood, opened up the evening with welcoming remarks, while event MC’s Royce Babble and Bria Janelle kicked off the awards ceremony. Media maven and longtime producer of Combat Jack’s radio show, A-King, presented renowned journalist of NPR, Rodney Carmichael, with the first-ever Combat Jack Storyteller Award. Next, music manager and executive Madeline Nelson, had the opportunity to present her client and business partner, Wyclef Jean, with the Social Impact Award; highlighting all of his philanthropic efforts not only in Haiti but worldwide. Concluding the award ceremony, legendary producer and DJ, Bryan Michael Cox, journeyed guests over two decades of friendship while honoring Jermaine Dupri with the Cultural Icon Award. As the reception concluded Wyclef Jean made an impromptu performance alongside of The Nourishment, rapping lyrics to his hit song with the Fugees – “Fu Gee La”. Wyclef also jumped on various instruments such as the keyboard and drums, playing alongside the house band. Following the “Welcome to ATL” reception, guests were invited out to Deep End for the official after party, with another guest performance by Wyclef Jean and his new artist Jazzy Amra. “It was a special night for A3C and the city of Atlanta. We have to highlight and pay respect to the trailblazers in our culture, or we’ll lose sight of how we got here and where we need to go.” – Mike Walbert.